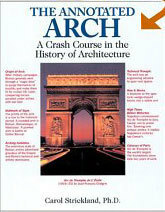 In 178 pages, including more than 250 images, The Annotated Arch crafts a readable, entertaining, and informative approach to the history of architecture. For anyone who loves architecture, or who wants to learn about it in an enjoyable way, this book (a Book-of-the-Month-Club selection) is the ideal introduction. As the author writes in the Introduction, Architecture is much more than the sum of singular parts. It's an art of interdependence, where separate elements interact with the time, place, materials, technology, economy, and individual genius. Goethe called architecture 'frozen music.' Sounding all the notes from high to low on the scale of human invention, architecture preserves the best-loved tunes of civilization.